The book is a photographic album with the views of the St.-Petersburg Buddhist temple and its interior, taken, in the early 1920s, by V. A. Sansero. The album belongs to the archive of the Institute of Oriental Manuscripts of the Russian Academy of Sciences in St.-Petersburg. It is a historical record of the period when the temple, being ransacked, in 1919, was then restored by the representative of Tibet in Soviet Russia, Agvan Dorzhiev. 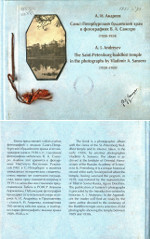 The publication of Sansero’s photographs is preceded by an introduction by the A.I. Andreyev.